California builders have hopefully regained their legislative right to repair actionable claims brought against them, the Fifth Appellate District of California has ruled. In McMillin Albany, LLC v. Superior Court (August 26, 2015 No. F06370) The Court issued a blistering rebuke of the Fourth District’s ruling in Liberty Mutual v. Brookfield, which opened up a Pandora’s box by allowing claims to circumvent the 12-year old Right to Repair Act otherwise known as SB 800. In a 20-page decision, the McMillin Court carefully reasoned that the express language of the Act and the detailed Senate Judiciary Committee analysis clearly demonstrates the sole remedy for enacting groundbreaking reform for resolving construction defect claims. In light of the Liberty Decision exactly two years ago, plaintiff attorneys quickly filed claims and refused to allow builders an opportunity to engage the homeowners directly and make repairs. By giving up SB 800 actionable claims, many of which do not require evidence of actual property damages, plaintiff lawyers seemed to shoot themselves in the foot by doing so, just to avoid the pre-litigation right to repair process. This new decision may cause plaintiff attorneys to re-think their game plan and allow builders with the resources to execute permanent repairs and resolve claims more quickly and efficiently. Not surprisingly, there will likely be more confusion as to which direction the lower courts may now take, since we have two diametrically opposite decisions from the Appellate Courts. Builders and homeowners alike certainly benefit from proper and thorough repairs to resolve actionable defects, but it may take a Supreme Court’s ruling to determine whether the right to repair law as negotiated by all parties in interest back in 2002 will survive the test of time. The legislature intended to create a comprehensive set of construction standards and to make the violation of any of those standards actionable under the Act. You can view the entire ruling here. On Feb. 24 Nevada Governor Brian Sandoval signed into law sweeping amendments to the NRS 40 “Right to Repair” process, making it more difficult for plaintiff attorneys to reap what has become a lucrative industry of rewarding plaintiffs for the filing of unsubstantiated defect claims. Nevada Assembly Bill 125 amends the definition of “constructional defect” which: 1) represents an unreasonable risk of injury to a person or property; or 2) which is not completed in a good and workmanlike manner and proximately causes physical damage to the residence or appurtenance. Prior interpretations merely needed only an opinion of a code violation or manufacturer’s installation guideline, which placed a perfection standard on the construction industry. The law also now requires specific details regarding the alleged defect, including the location, damage and injury of each defect and must include a statement signed by the owner of the home that the owner verifies each defect exists. The claimant and expert who provides such an opinion must be present during the inspection and identify the exact location of the alleged deficiency, which effectively abolishes the current trend of plaintiff consultants making unsubstantiated claims and causing frustration by builders and excessive investigative and legal costs. Builders who purchase home warranties also benefit under the changes. Homeowners must first make a claim under their warranty contract and have it denied prior to filing an NRS 40 claim with the builder. Only claims rejected by the warranty can be actionable. Attorneys’ fees are now stricken from the law, and other recoverable fees constituting damages must have been incurred for construction defects proven by the claimant. So-called “hunt and peck” exploratory and destructive testing costs that do not result in the discovery of the newly defined defect may no longer be compensable. The prior 10 year statute of repose for the filing of a claim has been greatly reduced to six years. Homeowner associations may no longer file claims unless their claim pertains exclusively to the common elements under control of the association. Subcontractors no longer are bound by contract language that requires them to defend, indemnify or otherwise hold harmless a builder when their work has been altered or modified by another trade or the builder. When a duty to a subcontractor remains for indemnity, it is triggered only upon the presentment of a claim from which it can be reasonably inferred that an alleged constructional defect was caused by or attributable to that subcontractor’s work, negligence or wrongful act or omission. New disclosures are required of the builder relating to wrap insurance credits, compensation, policy limits and other terms. Original provisions granting builders the right to inspect and repair identified deficiencies remain in the law, which will undoubtedly increase a builder’s desire to make needed repairs and resolve issues without incurring needless litigation costs. That is what this 20-year old law was originally intended to do—now there is hope that real defects can be mitigated without the high costs of attorneys and experts. The Court also looked to California's Right to Repair legislation (SB 800), despite the fact that SB800 specifically excludes apartment conversions as occurred here. The Court concluded that the plain language of SB800 Section 896 implicates design professionals when their design causes a violation of the standard due to a negligent act. Architects should pay special attention to this ruling and take aggressive steps to reduce their design errors by seeking qualified peer review of their work, standardizing and perfecting common building cladding and flashing details, and moving away from the traditional "builder's set" of minimalist construction drawings. Architects should be more involved in the selection of time-proven products to reduce incompatibility failures. All these have been proven to result in reduced liability for design professionals. The Fourth Circuit Appeals Court ruled (Click here to view the ruling) on Aug. 28 that California’s SB 800 (The Right to Repair Act) established by the legislature in 2003 is not the sole remedy for prosecuting construction defect claims. This published decision, if not overturned by the California Supreme Court will have an immediate negative impact for all California home builders. Home builders and trade associations believe the 2003 Right to Repair law was written specifically to encapsulate all causes of action (excluding fraud) for construction defects in dwellings. Homeowners can make claims for property damage and personal injuries long after the 4-year legislative statute has expired on issues such as plumbing and electrical systems, opening the door for up to 10 years on such damage claims. 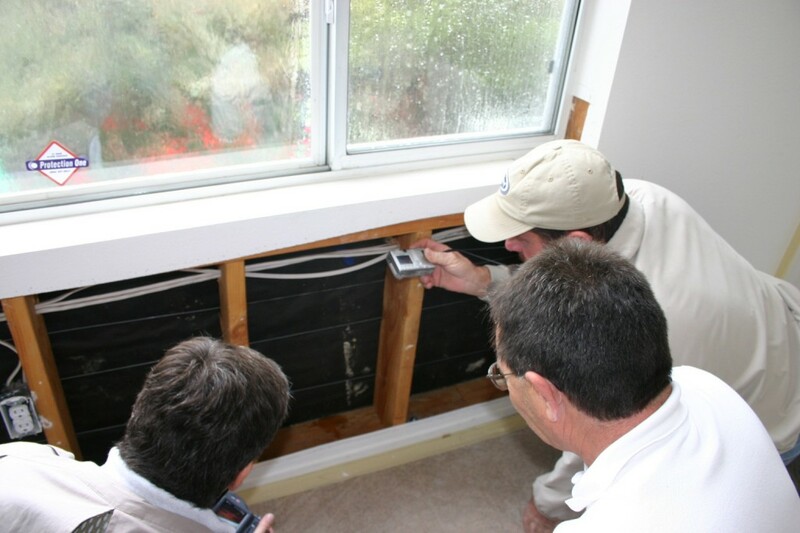 Homeowner’s insurance companies who traditionally foot the bill for water leakage and damage claims will likely increase subrogation claims against home builders, making it more difficult for builders to defend such claims when the alleged defect has been repaired and evidence may have been destroyed in the process. AxisPointe’s clients who rely on InSite Mobile™ already have an effective strategy against damage-related claims, since checkpoints related to life safety and building durability are top-priority risks for builders. One important conclusion is that builders need to ensure they have a robust risk strategy for water-related claims and capture evidence during construction that their installations are within standards, since such evidence may not be available in a subrogation action. AxisPointe recommends builders to capture at least 500 digital photographs of each home, with particular attention to document walls and ceilings prior to insulation. AxisPointe’s mobile smart phone apps provide a reliable and paperless method to quickly document the entire construction process and ensure compliance with building codes, standards and manufacturer guidelines. Stan Luhr takes over as AxisPointe's new CEO, Company will Leverage Its Risk Management Software to Run on the New IPhone Operating System for Instant Sharing of Field Operations, Quality and Risk Data as it Expands Services in Canada and Abroad. For additional information, please view the official public release. At this year's West Coast Casualty Technology Fair we ran a "Name the Defect" contest at our defect exhibit located in the center of the exhibition area. The contestants were asked to label as many defects they could find on our exhibit which was built with intentional defects. The contestant who correctly identified the most defects wins an iPod NANO! We have tallied up the results and we now have a winner! Congratulations to Rick Bush for correctly identifying the most defects! We also ran a business card raffle at our main booth for an iPod NANO as well. One business card was randomly selected from the ones that we received and we have a winner! Congratulations to Joyce J. Kapsal, an attorney with Epsten, Grinnell & Howell! The West Coast Casualty Technology Fair is currently in progress! Stop by our display located at the center of the exhibit hall! View our new and improved defect exhibit, live demonstrations of the various tools we utilize in the field, and take a shot at winning an iPod NANO by taking part in our Defect contest! Don't miss out! A hand-picked panel of Construction Forensic Experts will be sharing Industry Secrets at the Upcomming Symposium! Stan Luhr has been selected to host a special Experts Panel at this years West Coast Casualty Seminar! Click here to view Mr. Luhr's "If Expert's Coul Rule the World" article published in the West Coast Casualty Seminar 2010 Syllabus. Stan Luhr Ends Relationship with Quality Built - Click here to view the release! Pacific Property Consultants launches their new website!